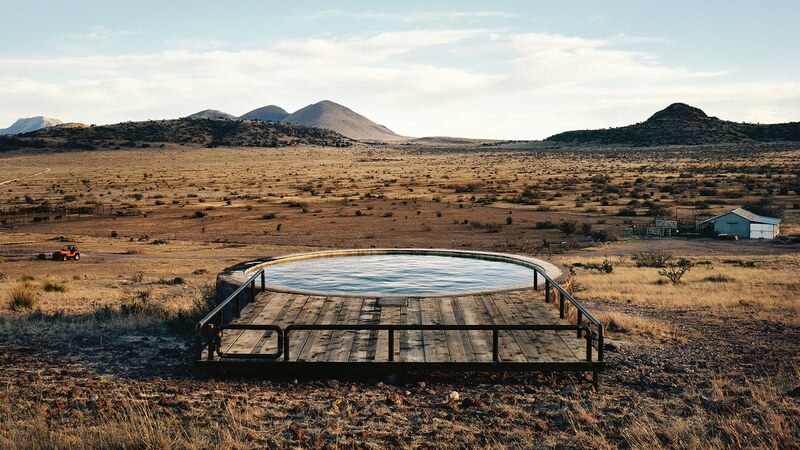 When Donald Judd began his Marfa project in the early 1970s, he would never have predicted the near mythic status it would end up achieving. 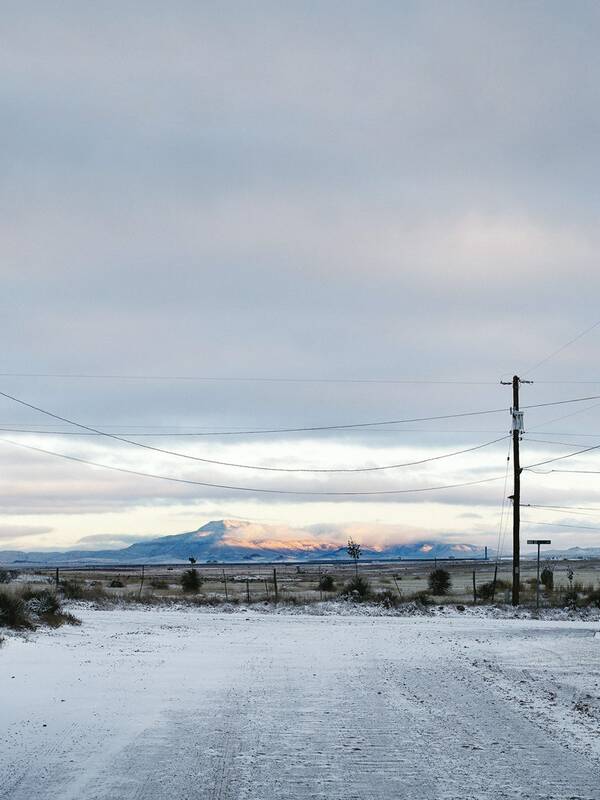 The small town of 2,000 residents is 20 miles from the next town and nearly three hours from the nearest major airport, yet it features a contemporary art museum, the Chinati Foundation, and the highly instagrammable Prada Marfa, and attracts artists, celebrities, and urbanites looking for a simpler life?or the latest music festival?all year-round. 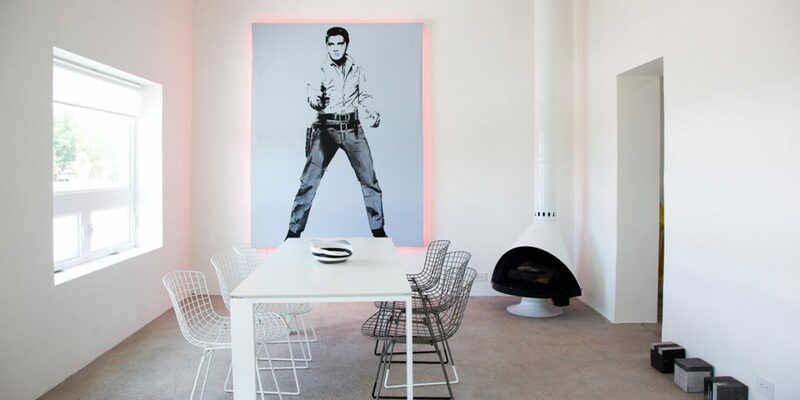 Besides the austerely beautiful high-desert landscape, this creative enclave is also well known for is its minimalist interiors, architecture, and furniture. 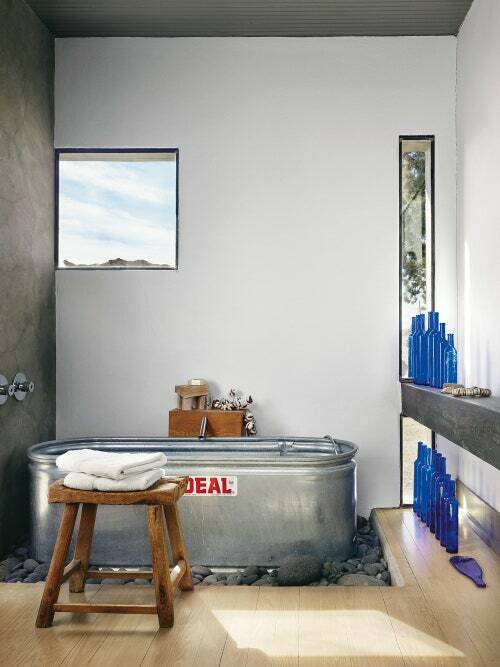 Last month, the Monacelli Press published Marfa Modern: Artistic Interiors of the West Texas High Desert, Helen Thompson?s look at 21 homes that illustrate the former water-stop’s sky, light, and unique sense of isolation. 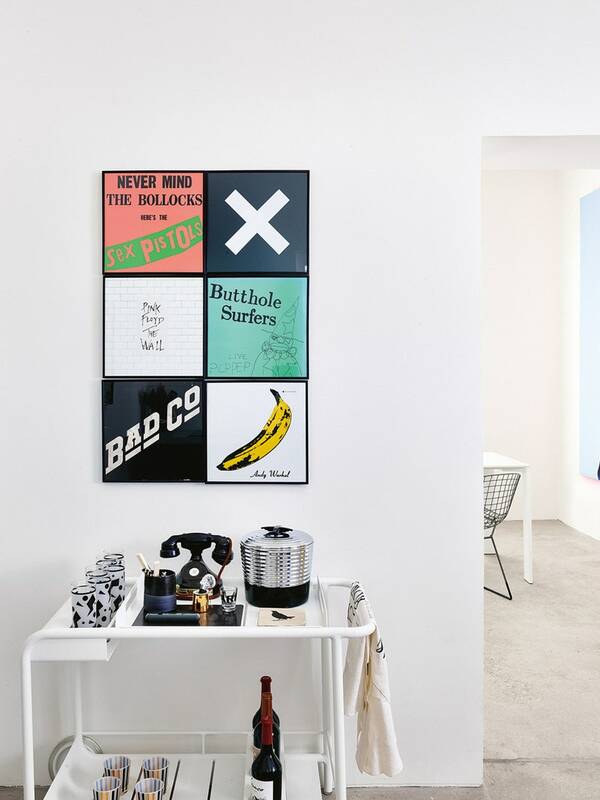 Here, a preview of seven of the homes featured inside. 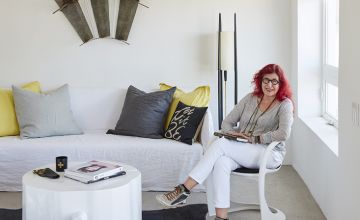 Trendsetting Austin hotelier Liz Lambert renovated Marfa’s 1950s-era Thunderbird Hotel into a boutique hotel, transformed a large plot of land into El Cosmico, a “nomadic hotel and campground”, and spiffed up an adobe bunkhouse that used to belong to her uncle for herself in the meantime. A water tank is a short jeep ride from the house?it’s her favorite spot for a quick swim and a breathtaking desert view (see above). A screened-in porch just behind the kitchen shelters a long table made of industrial drums and a plank where Lambert’s many parties spill out onto. A laundry room to the right of the living and dining room was turned into her bedroom. 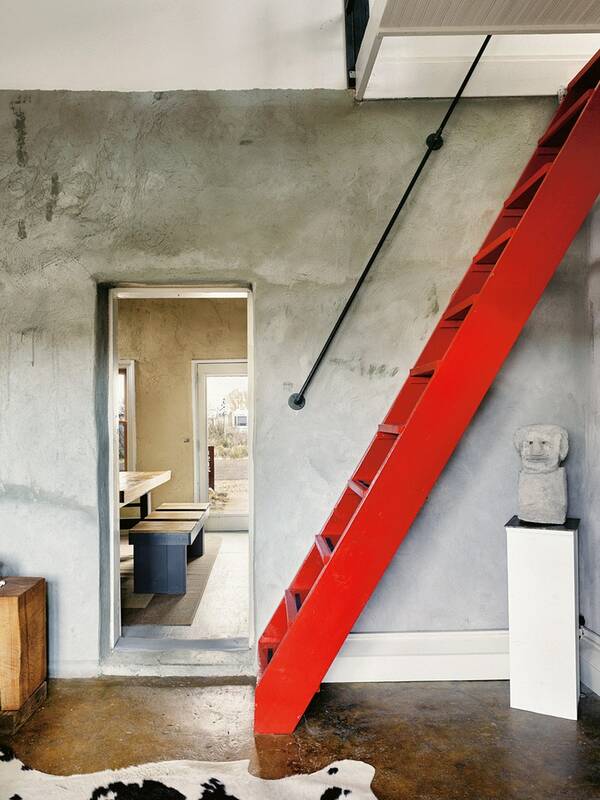 The house’s ad hoc revival includes clever uses of industrial materials. 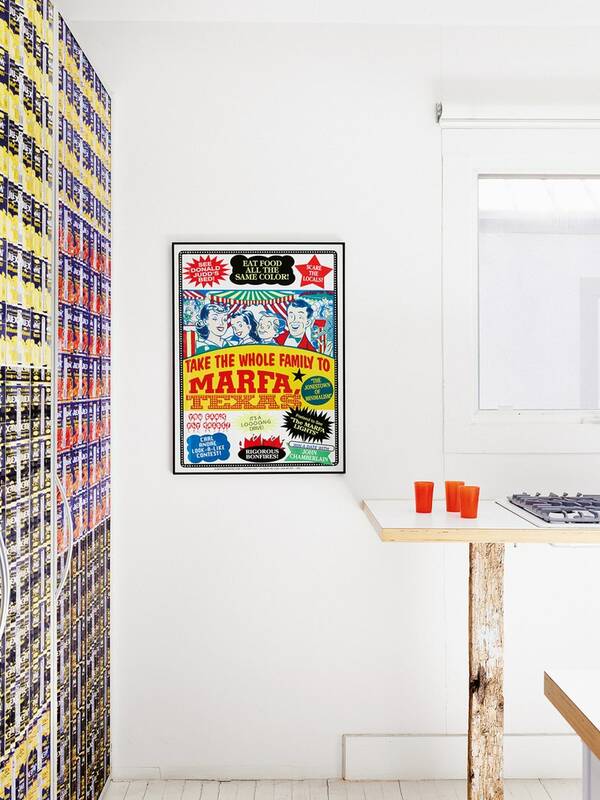 Part of a vintage metal sign is used as a sliding door that closes off the kitchen from the dining area, for example, and a “chandelier” fashioned from a long piece of pipe serves to light the dinner table at night. 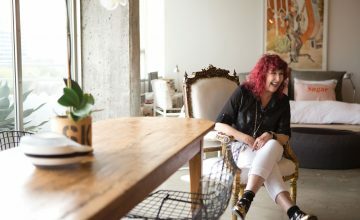 Houston-based architectural designer Barbara Hill, a red-haired “Miss Texas, 1956”, prefers to remove decorative and architectural elements rather than add them. She spent a year and a half transforming this adobe building, which had been a private dance hall, grocery, and candy store in turn. The house is located downtown and passersby, curious to see what’s beyond the wall, often peer over the top for a look. 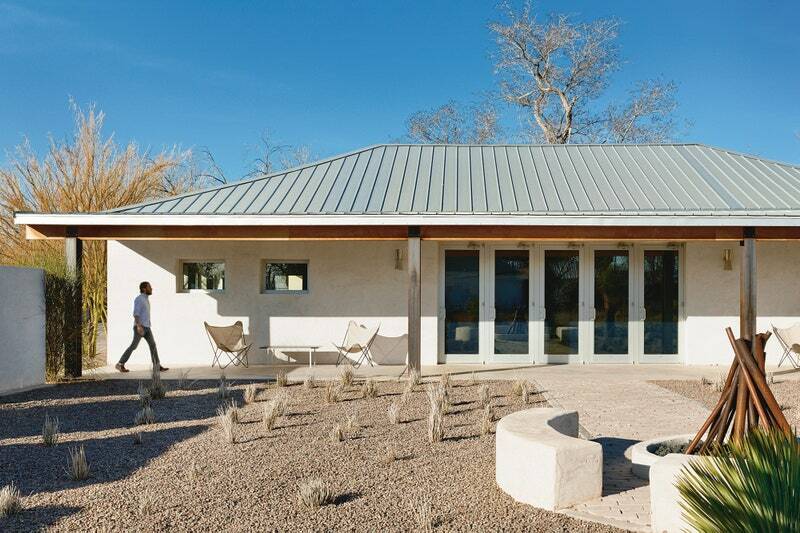 Their curiosity is rewarded by a view of a fire pit that anchors the front yard, which was created by Houston and Marfa-based metal artist George Sacaris. 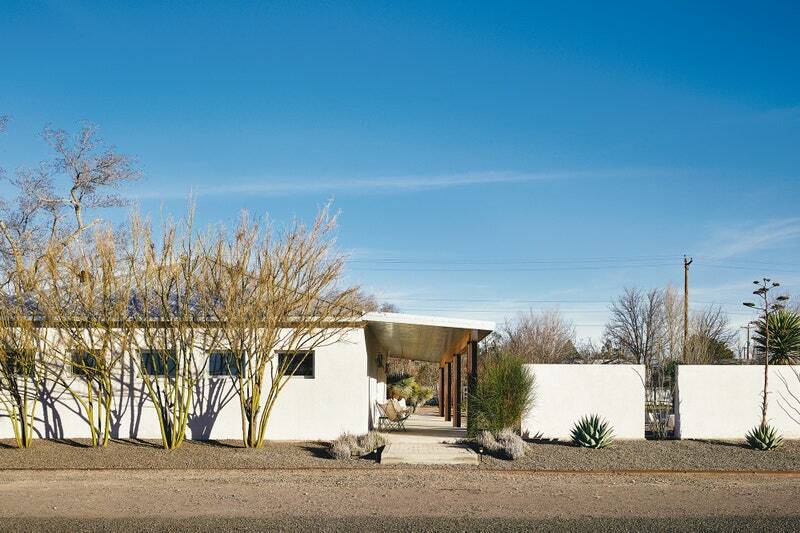 Marfa resident and landscape architect Jim Martinez designed the garden. Hill used birth plywood on both the ceiling and the floor of her home, for visual continuity. 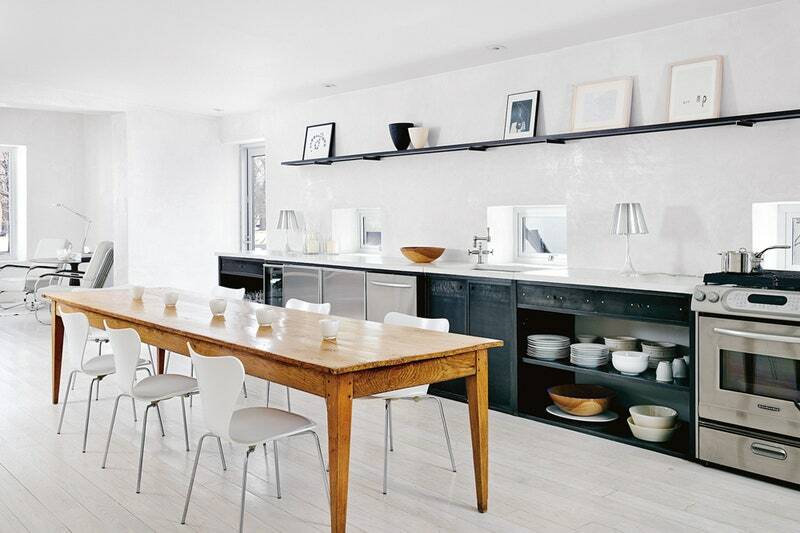 White plaster walls add luminous glamour to the rough-and-ready d?cor. 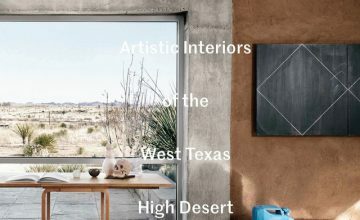 Deep-set windows throughout soften Marfa’s glaring midday light and suggest that the hefty structure is here to stay. 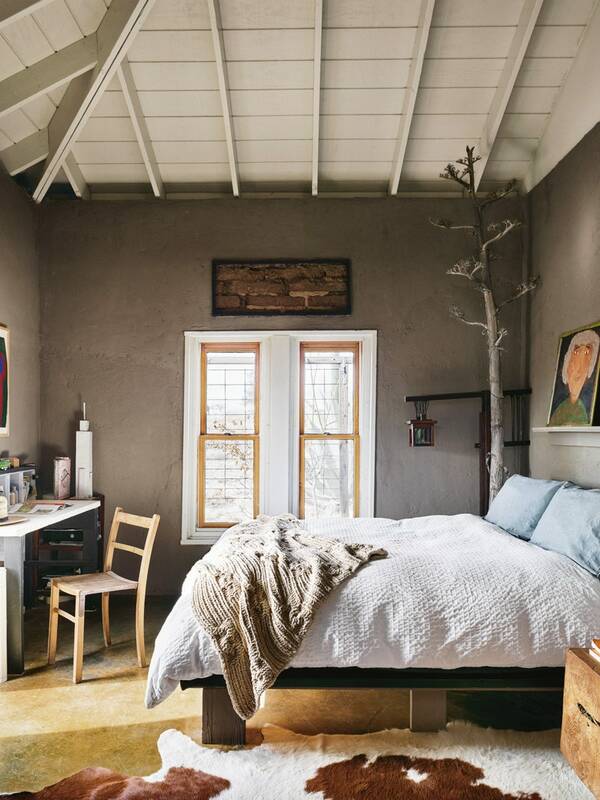 King and Lisa Grossman purchased this century-old adobe building from Barbara Hill; she used it as a weekend retreat but it was once a lawyer’s office and later, a beauty parlor. 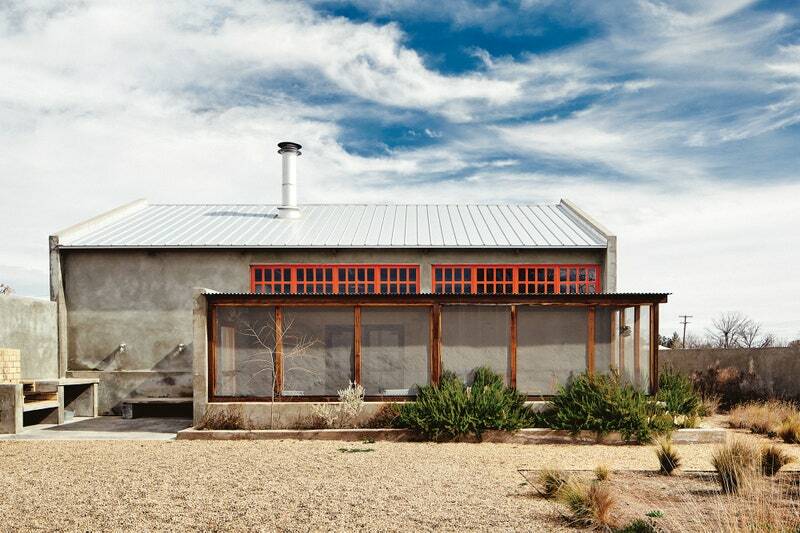 Two delicate-looking steel rods stretch across both edges of the room’s width?these necessary structural elements are much stronger than they look and give the adobe lateral support. 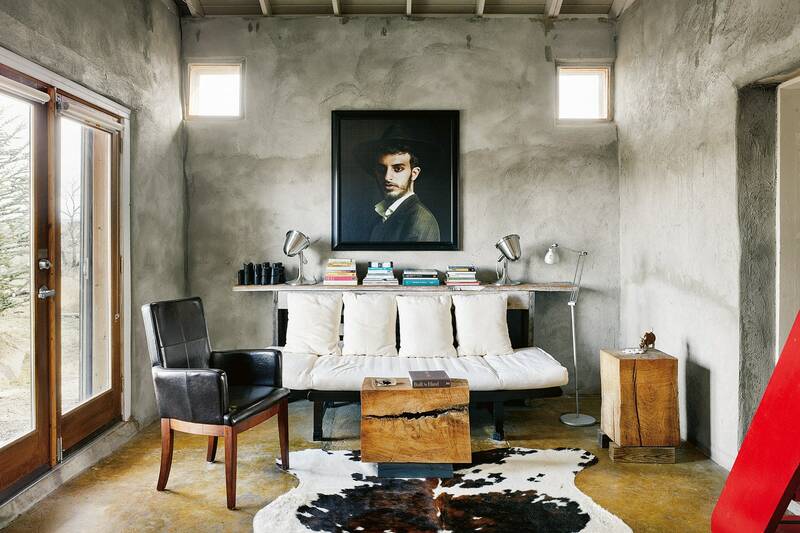 The hay bale coffee table is by The Art Guys, and a pair of Charles and Ray Eames sofas flank the table. In the main house, elements such as the 10-foot-high ceilings, 14-inch walls, and painted wood doors were kept intact. Longleaf pine floors were used elsewhere in the house. Not long after Tokerud and her partner, Rick Houser, finished renovating, however, another fire broke out in the kitchen. 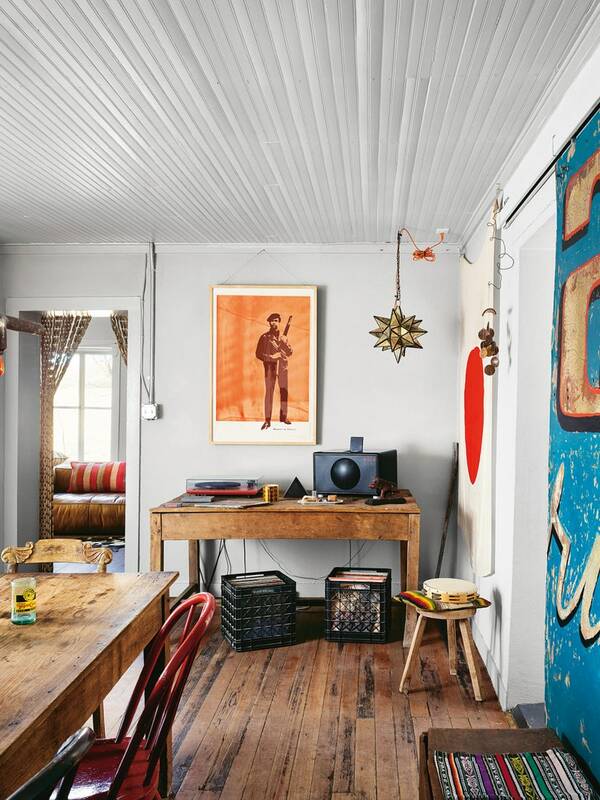 The repairs offered an opportunity for upgrades, such as plaster walls, discreetly recessed track lighting, and multiple coats of a glossy paint on the ceiling. 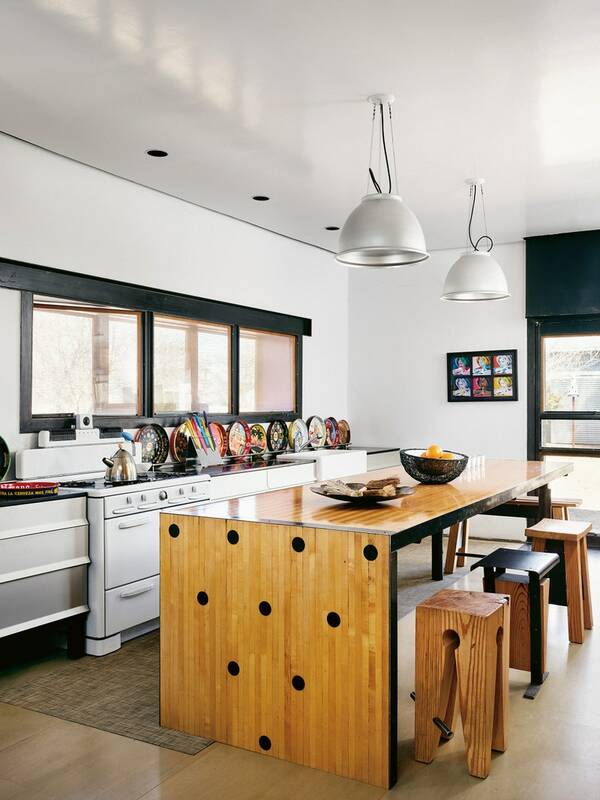 Houser built a kitchen island out of half a bowling lane imported from El Paso and brought in industrial lighting form his Houston woodworking shop. 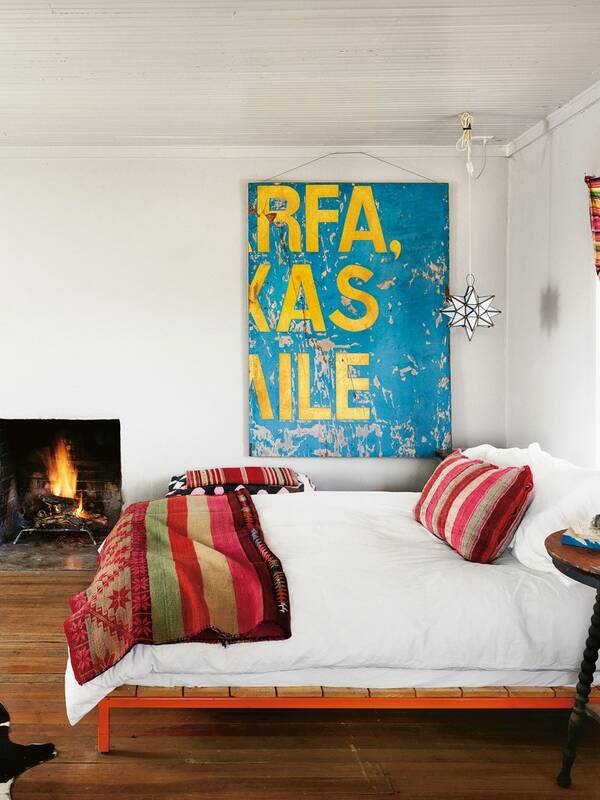 In the living room, a Christian Liaigre chaise serves as an antidote to the circa 1904 house’s rustic underpinnings. 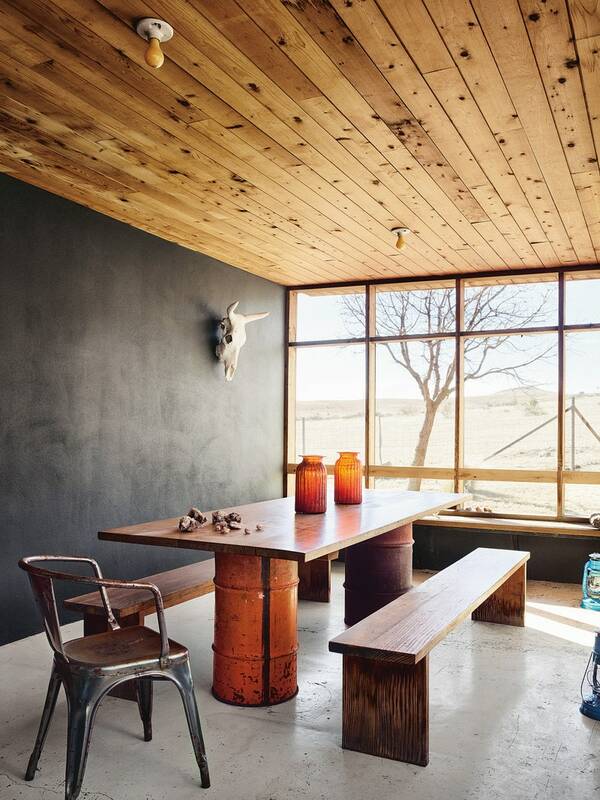 Metal artist George Sacaris built the base for the pine dining table, which was formerly a Mexican door. 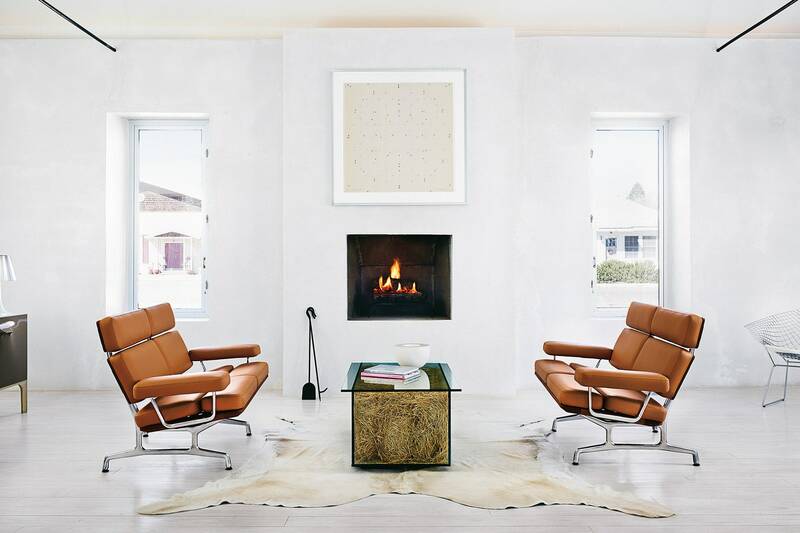 Landscape designer Jim Martinez and his partner, Jim Fissel, purchased this property in 2003 to provide a welcome counterpoint to their busy urban lives in Dallas. The two were the first in town to use Hebel blocks; concrete blocks that are one-third the weight of traditional concrete with a high insulation value. 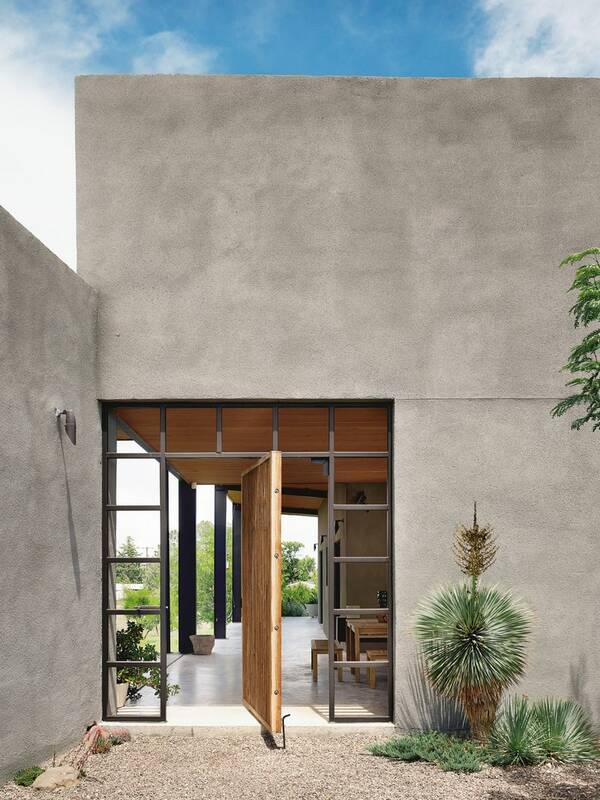 The design of the massive tongue-in-groove front “door”?really, a gate that opens from an exterior courtyard into the interior courtyard?can be positioned to direct cooling breezes straight inside. A passerby would never guess that the building’s two wings, which open eighty degrees to take in the North view, are as much glass as wall. 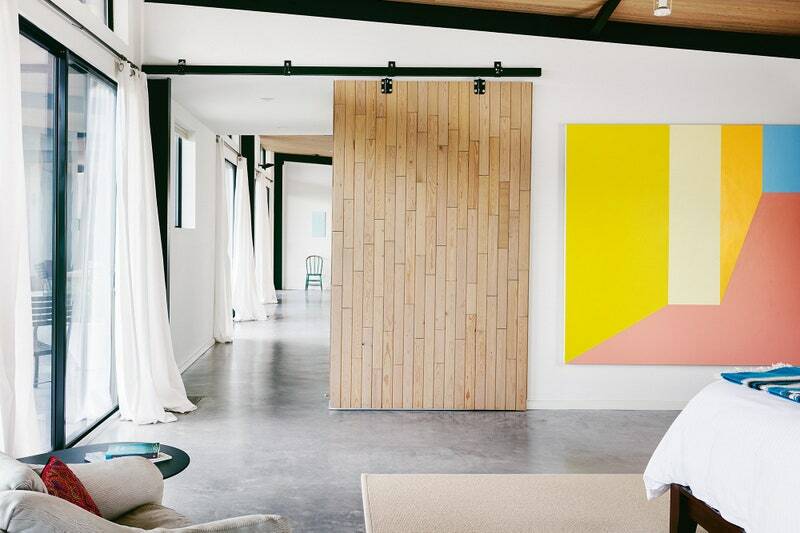 On the site of a former Volkswagen repair shop known as George’s Garage, Vilis Inde, a lawyer turned art collector and gallery owner, and his partner, Tom Jacobs, decided to build a gallery and residence. Pard Morrison’s fired-pigment-on-aluminum sculpture Schneewittchen, 2013, stands tall in a courtyard between the gallery side of the building and the residence. An orange chair by Donald Judd is just visible beyond, in the gallery. A grid pattern inlaid in the interior courtyard defines the space. 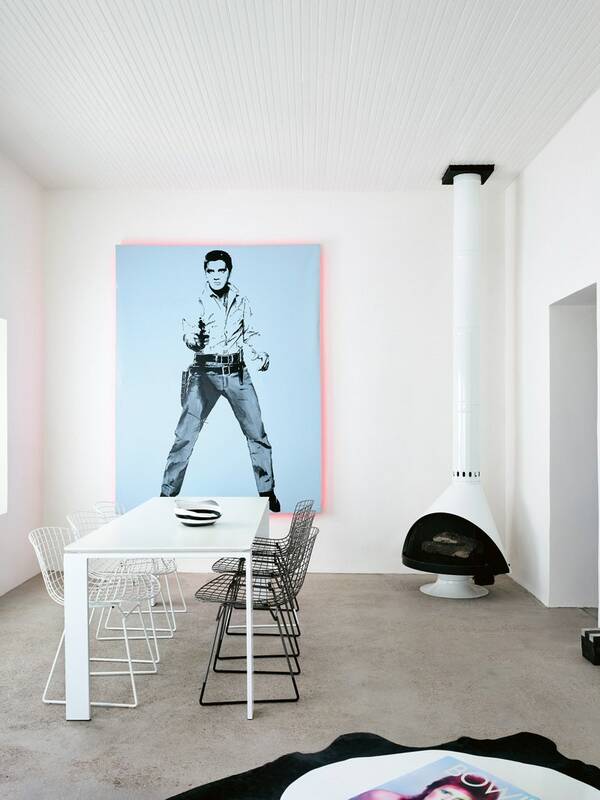 This is a house built for living, but also for art. 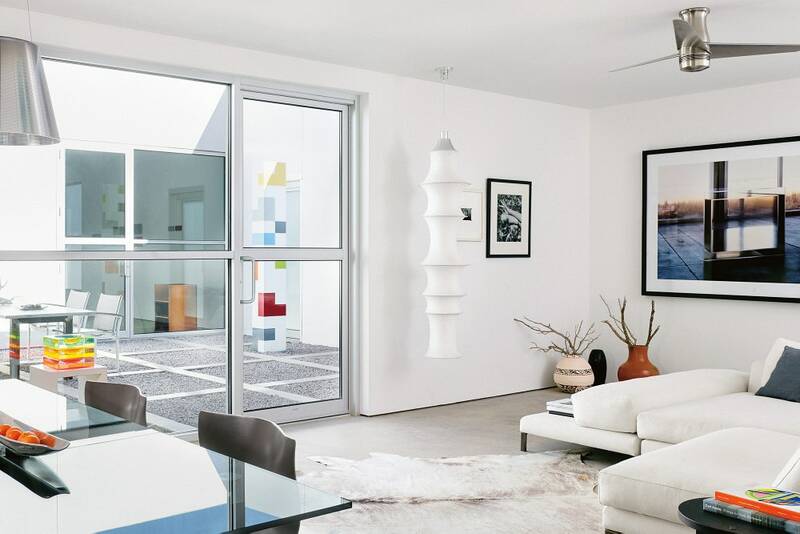 The all-white residence and gallery are designed to help it recede in an unobtrusive way?both from the perspective of the viewer in the street as well as from a visitor stepping inside. 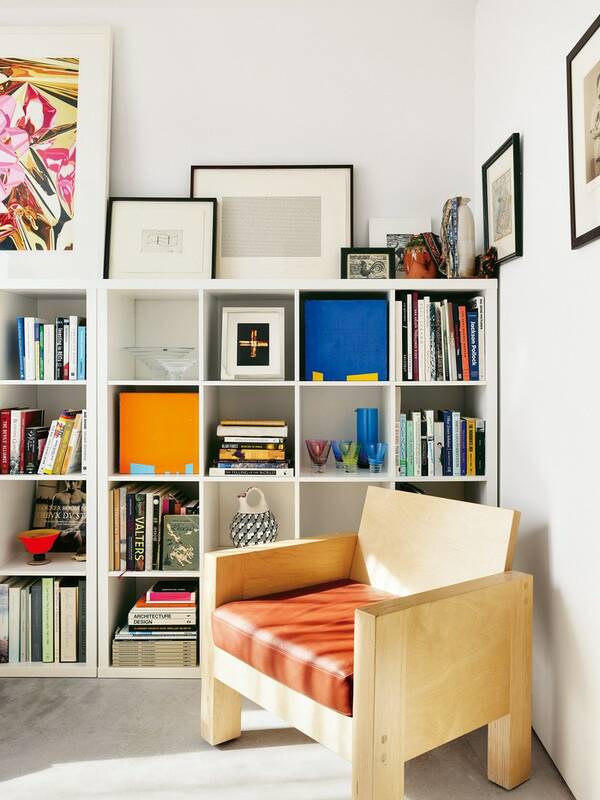 Box shapes play a dominant role in the gallery’s design, and squares appear as a recurring motif throughout the bedroom, as with the bookshelves and the chair. A dried agave plant in a corner of the downstairs bedroom emphasizes the ceiling height (which Nowell raised from seven to ten feet). A “truth window” above the pairs of windows exposes the original adobe brick. Both inside and out, the adobe blocks are covered in cement. 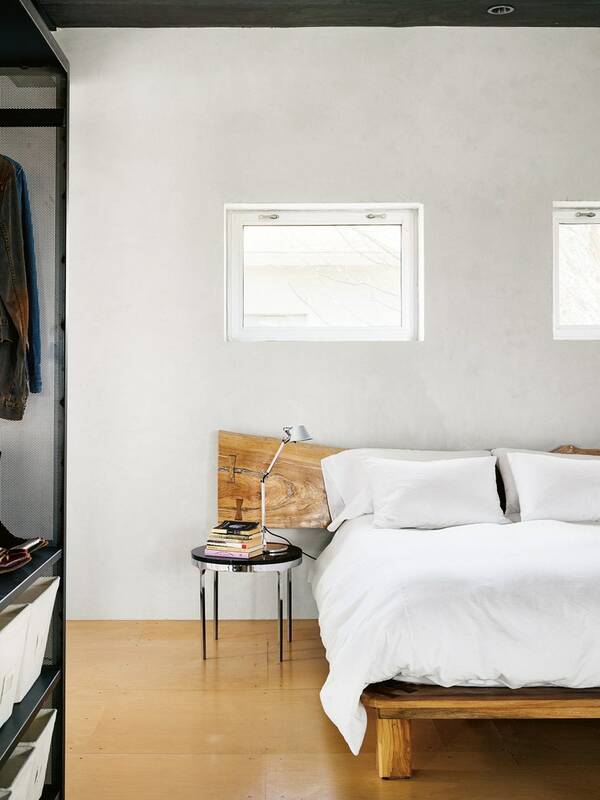 Nowell made the white pine bed, wood block table, the desk, and the floor lamp. He also built the wood side table.